A guide to completing and filing a Chapter 13 bankruptcy. eliminate some or all of general unsecured debts. The purpose of this article is to provide basic information about the common forms and procedures involved in filing for Chapter 13 bankruptcy. It is designed to serve as a general guide only, and not as instructions for filling out the forms. Keep in mind that in addition to these forms, each bankruptcy jurisdiction has its own local forms, rules, and procedures you must follow to successfully complete your case. Chapter 13 bankruptcy is a complex process and very few individuals who file on their own succeed. It’s advisable to hire an attorney to represent you, or at the very least, talk to a knowledgeable bankruptcy attorney prior to filing your case. To learn more, see our topic area on Chapter 13 Bankruptcy. For a comprehensive guide to CHapter 13 bankruptcy, see Nolo's book, Chapter 13 Bankruptcy. Below, we discuss the most common forms and schedules that are part of a Chapter 13 bankruptcy petition. However, depending on where you live, your local bankruptcy court may require additional forms. For more information on bankruptcy forms and filing requirements, see our topic area on Filing for Bankruptcy. The Voluntary Petition for Individuals Filing for Bankruptcy is the introductory form where you disclose your personal information (such as your name and address) and indicate that you are filing for Chapter 13 bankruptcy. You also provide information about the nature of your debts (such as consumer or business), estimated number of creditors, amount of assets and liabilities, and any prior bankruptcies filed within the last eight years. Before you can file for Chapter 13 bankruptcy, you must also complete a credit counseling course with an approved agency. Once you obtain your credit counseling certificate, you must complete Part 5 of the voluntary petition and attach your completion certificate. On Schedule A/B, you must disclose all of your ownership interests in both real property and personal property. Real property includes your house, condominium, land, or any other type of real estate you have an interest in. When filling out Schedule A/B, follow the instructions and provide the description and location of the property, the nature and value of your interest, and the amount of secured claims (such as mortgages or other liens) encumbering the property. Schedule A/B is also where you list all of your personal property (property other than real estate). Personal property includes assets such as cash, bank accounts, household goods, clothing, insurance policies, stocks, bonds, annuities, retirement accounts, cars, musical instruments, and any other property of value. Schedule A/B lists the types of assets that should be disclosed on this form. Include all of your property even if you think it is worthless. If you intentionally omit or hide assets, you may be denied your discharge and even prosecuted for bankruptcy fraud. When valuing your personal property in in bankruptcy, use the property's replacement value. Replacement value is the amount of money it would cost to purchase an item of comparable age and condition (what a retail merchant would charge for a similar item). Chapter 13 bankruptcy is commonly referred to as a reorganization bankruptcy. Unlike in Chapter 7 bankruptcy, the Chapter 13 bankruptcy trustee will not sell your assets to pay back your creditors. However, if you have nonexempt assets–meaning assets you wouldn’t be able to keep if you filed a Chapter 7 bankruptcy—your monthly Chapter 13 payment must be at least enough to pay the value of the nonexempt property to your unsecured creditors over the course of your proposed repayment plan. This means that the amount you must pay to unsecured creditors depends in part on the exemptions available to you. Each state (and the federal system) has its own set of bankruptcy exemptions. While most states require you to use the state’s set of exemptions, a few states allow residents to use federal exemptions. Schedule C is where you claim your exemptions for each piece of property you own. Since having nonexempt assets means paying more to your creditors, it is an extremely important form. In order to complete Schedule C, you must determine which bankruptcy exemptions are available to you and research them thoroughly. If you are unsure about whether your property is exempt, talk to a bankruptcy attorney in your area. A creditor has a secured claim if you pledged an asset as collateral to secure its loan. If you don’t make your loan payments, the creditor can take back the property through foreclosure or repossession to satisfy the debt. The most common examples of secured claims are your mortgage and car loan. Schedule D is where you list all of your secured debts. When you fill out Schedule D, provide the creditor’s name and contact information, the nature and amount of the lien (usually how much you owe), the date it was incurred, and the description and value of the property subject to the lien. If the amount you owe exceeds the value of the property, list the difference in the unsecured portion column. Schedule E/F is where you list all of your debts that you didn’t already list on Schedule A/B. This includes debt such as credit card debt, medical bills, personal loans, outstanding taxes, and support obligations. While most of these debts are dischargeable, not all are. Congress has decided that certain types of debt (called priority claims) are too important to be dischargeable in bankruptcy. This means that bankruptcy doesn’t eliminate your obligation to pay back priority debts. However, Chapter 13 bankruptcy can provide an affordable way to pay off these debts through your repayment plan over the next three to five years. Common priority debts include recent tax obligations, alimony, and child support. Schedule E/F contains detailed instructions regarding which types of debt listed on this form are considered priority. If you believe that only a certain amount of a creditor’s claim is entitled to priority, disclose the entire claim but list the portion not entitled to priority in the appropriate column. You must disclose all of your debts even if you want to pay them back. If you forget to list a debt, it may not get discharged in your bankruptcy. Carefully review all of your debts to make sure they are included. It is typically a good idea to obtain a copy of your credit report and compare it against your outstanding bills so that you don’t miss anything. If a secured lender forecloses on or repossesses your property, it will typically sell that asset to satisfy its debt. If the sale proceeds don’t cover the balance of your loan, you may be responsible for paying back the deficiency (whether you can be held liable for a deficiency depends on the type of property and your state’s deficiency laws). If you have a deficiency balance, list it on Schedule E/F because it is no longer treated as a secured debt. To learn more, see Will Bankruptcy Remove a Deficiency Judgment? Executory contracts and unexpired leases are contracts under which each party still has obligations to perform. When you file for bankruptcy, you can decide to assume or reject the contract or lease. If you want to assume it, you must be able to afford the payments in addition to your monthly Chapter 13 plan payment. Whether you make the payments through your Chapter 13 bankruptcy or outside of it depends on the rules in your jurisdiction. If you reject the lease you can simply return the property, and any missed payments or penalties will be treated as unsecured debts and wiped out when you receive your discharge. If you have codebtors on any of your debts, you list them on Schedule H. While your discharge only eliminates your liability for the debt, you can still protect your cosigners by paying off the obligation through your Chapter 13 plan. However, since you can’t choose to pay one creditor over another, fully paying your codebtor’s creditor (especially a general unsecured creditor) could have the effect of requiring you to pay all unsecured creditors in full—a result most bankruptcy filers would find unsatisfactory. In most cases, as long as you make timely plan payments to the trustee to pay off the debt, the Chapter 13 codebtor stay will prohibit creditors from going after your cosigners. For more information on how the codebtor stay protects your cosigners in Chapter 13 bankruptcy, see Loan Cosigners and Chapter 13 Bankruptcy. In Chapter 13 bankruptcy, your monthly budget goes hand in hand with your proposed repayment plan. Schedule I is the income component of your budget. It is where you list your employment information and how much you make each month. Follow the instructions on the form to disclose your income from each source on the appropriate line. Keep in mind that if you are married but filing for bankruptcy without your spouse, you still have to include your nonfiling spouse’s income on Schedule I.
Click here to see a copy of Schedule I: Your Income. For more detailed information on how to fill out Schedule I, see Completing Bankruptcy Schedule I. Schedule J is where you list your monthly expenses. The expenses listed on Schedule J are subtracted from your average income on Schedule I to give the court an idea of your monthly net income. Because these figures play a large part in determining your plan payment, it is important to be as accurate as possible. A good rule of thumb is to make sure you can produce receipts to validate your claimed expenses, if necessary. In general, the amount of monthly net income left over after deducting all expenses should equal your proposed monthly plan payment. If your plan payment is less than your monthly net income, the trustee will argue that you have the means to pay more. If your plan payment is higher, the trustee can argue that your plan is not feasible because you can’t afford it. Click here to see a copy of Schedule J: Your Expenses. 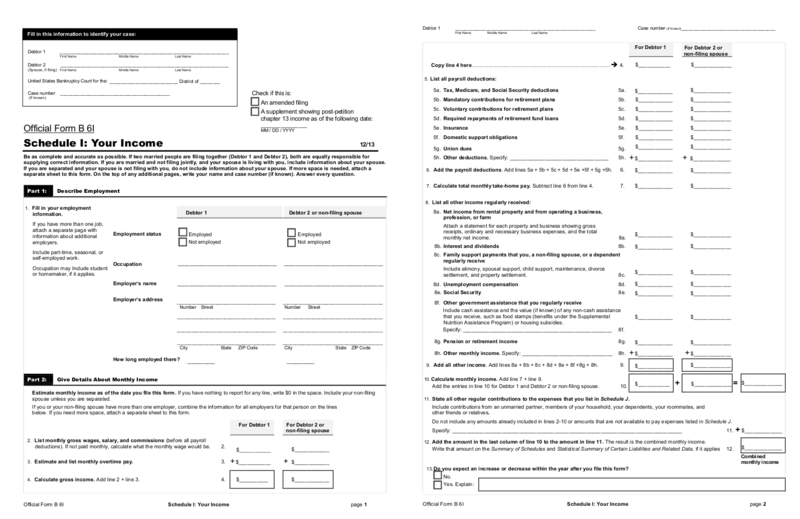 Once you complete Schedules A/B through J, you must summarize the totals on this form. This gives the court and trustee a snapshot of your entire financial situation. For example, it provides the court with a summary of the types of debt you have as well as your income and expenses. Keep in mind that if you have too much debt, you may not qualify for Chapter 13 bankruptcy. To learn more, see Debt Limits for Chapter 13 Bankruptcy. By signing this form, you declare that your bankruptcy schedules are true and correct to the best of your knowledge. Keep in mind that you are signing this declaration under penalty of perjury. If you lie on your bankruptcy papers, your case may be dismissed without a discharge and you can face criminal charges for bankruptcy fraud. Your Statement of Financial Affairs for Individuals Filing for Bankruptcy (statement of financial affairs) is a lengthy form that has numerous questions regarding your recent financial dealings. On the statement of financial affairs, you must disclose information such your gross income from all sources for the last two years, recent payments to creditors, lawsuits you are involved in, prior foreclosures and repossessions, transfers of property, closed bank accounts, and details about your business. Because this is a complicated form, review each question carefully to make sure you answer it accurately. This form is commonly referred to as the Chapter 13 means test. It calculates the length of your repayment plan and the amount you must pay unsecured creditors. If your average monthly income for the six-month period prior to bankruptcy is below your state’s median income for a similar household, you don’t have to complete the entire form and can propose a three-year repayment plan. However, if your income is above median, you must fill out the whole form and be in a five-year repayment plan. Follow the instructions on the form to calculate your income and expenses. When you reach the end, you will have a monthly disposable income figure. If this is a positive number, you’ll pay this amount each month over the course of your repayment plan. If it is a negative number, you haven’t shown that you have enough discretionary income to fund a repayment plan and likely will not be able to file Chapter 13. Because it is a complex form, you might want to consult with a bankruptcy attorney to ensure you’ve completed it accurately. In Chapter 13 bankruptcy, you propose a plan to pay back some or all of your debts over the next three to five years. Your repayment plan is one of the most important forms you must complete. But it is also the most complicated. The vast majority of debtors will need the assistance of an attorney to complete the plan. Each bankruptcy jurisdiction has a unique Chapter 13 plan form. Carefully follow the instructions on the form when filling it out. Most Chapter 13 plans have specific sections for each type of debt. Keep in mind that you must pay all mortgage arrearages (if you want to keep the house), all overdue car payments (if you want to keep your car), and priority debts in full through your plan. As well, if you have nonexempt assets , you must at least pay your unsecured creditors an amount equal to the value of the nonexempt assets (the assets you would not be able to keep if you filed Chapter 7). Your plan length can’t exceed five years so your monthly payment will depend on the amount of debt you have to pay back. For more information, see our topic area on the Chapter 13 Repayment Plan. Because bankruptcy is a financial proceeding, it is tied to your social security number and will appear on your credit report. Your Statement About Social Security Numbers will not be visible to the public due to the sensitive nature of the information it contains. As a result, each bankruptcy court will typically have special instructions on how to file this form. Currently, the required court filing fee for a Chapter 13 bankruptcy is $310. But court filing fees are updated periodically and can change. In addition to completing the forms listed above, you will need to prepare a creditor mailing list (also called a creditor matrix) for the court before filing your case. The court uses the creditor matrix to send notice of your bankruptcy to all of your creditors. This is very important in Chapter 13 bankruptcy because your creditors will file claims with the court to get paid through your repayment plan. Each court has its own formatting guidelines for creditor mailing lists. As a result, check with your local bankruptcy court to learn the requirements in your area before preparing your creditor mailing list. After you file your bankruptcy, the court will notify you of the date and location of your meeting of creditors (also called the 341 hearing). The meeting of creditors is a mandatory hearing where the trustee and your creditors can ask you questions under oath about your financial affairs and the information disclosed in your bankruptcy petition. If your repayment plan is confirmed (approved), you must make monthly payments to the trustee until it is paid off before you can obtain a discharge. Your meeting of creditors will typically be scheduled for 20 to 40 days after your filing date. If you fail to attend, your case will usually be dismissed without a discharge of your debts. As a result, if you can’t make it to your 341 hearing, notify the trustee immediately.